Simple breakout board for a flat flex cable with up to 30 conductors. For 1mm pitch cables. Comes unassembled. 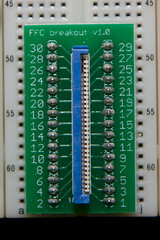 Includes board, FFC connector, and header pins. Here is a picture of the board in use. $18 includes shipping to the United States. $23 internationally. Instead of having more made and stocking them myself, I have shared an updated (smaller) version of the board at OSH Park. It can be purchased there, 3 copies for $4. The connector can be purchased from Mouser.